No. Sometimes, it's downright pathetic and senseless. What I mean is that sometimes things happen that there is no good reason for it to have happened in the first place. Yes, we live in a "third-world" country. Yes, lots of folks have dogs, Dianna and I included. But when you have owners of dogs who repeatedly fail to recognize and follow simple responsibilities - such as either keeping their dogs chained up when outside, or better yet, having a fenced yard to keep the animals in. Now, I mentioned "third-world" country for a reason. I walk both of my dogs every day for several miles into downtown Corozal and back to our home on Ferry road. A friend of ours walks her dogs with mine as well. We keep our dogs leashed up and under control. Yes, we even pick up poop after the dogs (thankfully, there are many trash barrels conveniently located to deposit such prizes). We realized today while walking, that the only dogs causing problems while we're walking, and we see a lot of dogs, are Gringo dogs. More specifically, it's the Gringo owners of the dogs who cause the problem. Native Belizeans, for the most part, either keep their dogs on chains or ropes, or keep them in fenced yards. There is one road I never walk down, although we have several friends who live there. That's Bay Shore Drive. Why? Here's a perfect example of why I don't. Last Sunday, Jim and Melanie Voris who live on Bay Shore Drive, suffered a horrible and senseless loss when their elderly dog, Polly, was attacked and killed by a large Boxer dog named Buster. Buster, and several other dogs live close by. They continually run free in the neighborhood. The dogs have a popularly known history of threatening and attacking people, grownups and children. I fail to understand how and why the owners do not exercise proper care and control of their dogs - especially with this apparent behavior history. In fact, while we were living at Jim and Melanie's, a young girl from the Copper Bank area was bitten by Buster. Additionally, the Voris' caretaker, Carlos, has on several occasions, been threatened by Buster, while Carlos was working in the Voris' yard! This latest incident is really two incidents. First is the senseless attack on Polly by Buster, and the second, was a rather severe bite (as you can see below) on the thigh of Carol Rainsford. She and her husband, Dave, were guests at the Voris' house at the time of the attack. "I am sad to report the tragic death of Polly, our beloved Yorkey of 16 years this month. 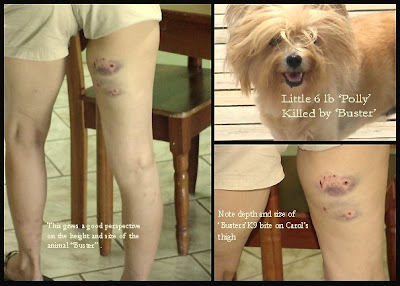 She was mauled to death by the next door mob of dogs [led] by a boxer named "Buster". In addiition, as we attempted to pull the dogs off Polly (who by way was was on the far North side of our property on the ramp to our patio), also bit a guest at the house on the thigh leaving clear teeth bite marks, as they tried to protect me from attack, as I was attempting to shield Polly. This is the seventh incident that I am aware of involving "Buster" in the neighborhood. I am DEMANDING that this animal be put down as a [menace] to humans and other properly controlled animals, and that the owners be required to show that they are responsible dog owners and can control their animals by keeping them on their property." Polly, who, if you didn't know, in addition to being 16 years old, was also blind and deaf, and probably was going to die of natural causes before too much longer anyway. It's just a shame that she didn't get to depart this life in a more gentle and restful manner. I'm not sure that calling for Buster to be put down will solve anything, although I can certainly see that as a viable option if Buster's owners refuse to accept responsibility for their dog's actions and behavior. The clear track record is there and calls for action of some sort. So far, it seems the owners are purposely staying blind to the facts of the behavior their dogs are exhibiting. To what purpose I have no idea. Would you recommend to anyone, much less anyone with children, that they come to Beautiful Corozal and stay anywhere on the south end? I wouldn't, and I won't, until Buster's owners show a clear change in attitude and show by their actions that they have accepted a responsible and proper way of controlling and caring for their dogs. Our hearts go out to Jim and Melanie for their loss of Polly. They have our sympathy. Likewise, we are sympathetic for Carol and Dave Rainsford. They were here, looking at Corozal as a possible location to live. My guess is that's not likely to happen now. And, finally, I have nothing but sadness and pity for Buster's owners and the pathetic and irresponsible manner they continue to exhibit in dealing with this situation. One can only hope they come to their senses sooner than later. Sorry to hear about your dog problems in Corozal. Will try to remember not to walk down Almond Drive (of course, being 60 I tend to forget stuff now days) when we come down. Do you expect any action by the local authorities?? I mis-stated the street name - it's Bay Shore Drive. I've corrected the posting. I honestly don't know. It sort of depends on what Jim and Melanie want to do and, of course, how much political pull they can muster. Otherwise, the real Almond Drive is a nice walk. There are a couple of dogs (owned by a Gringo) that do come out barking, but no bite. The rest of town is great for walking, once you know the areas of town (e.g., avoiding "Skeleton Town" anytime on foot is probably a good idea). But until you get here, and learn the lay of the land. You know how it goes. Hey, I'm almost 60 (I'll be 59 in Jan), I forget stuff all the time. You mean it gets worse? Wow, that is just awful. If it was me, and the law wouldn't prevail, I'd take the matter into my own hands. But of course, that's just me. You know what's really bad. I said 60 and I am really 61 (62 in April). Boy, that's not good - the not willing to say (admit) how old I am! Oh well, I added your info to my "Notes about Corozal" -- which I really, really, really intend to read again on the flight down. That's along with the one on "Tips on Driving in Belize". The last one is a real hoot -- especially "how to turn left by moving way over to the right and letting everyone go by first" ... is this one actually for real?? Yes, pulling over to the right prior to turning left (only if someone is behind you or coming up behind you) is the law. It takes a bit of getting used to, but once you do, it really works well. Screws things up if tourists don't do it as you can imagine. As I understand, this has been a long-standing issue. No easy solution for anyone involved. Maybe the dog needs to get Tazer'd next time he gets too close. Are they legal in Belize? I agree with the tazer advice. They work on four legged as well as two legged beasts. A machete would keep you at arms length. As I said when I started this blog, I would cover the good and the bad, or something to that effect. 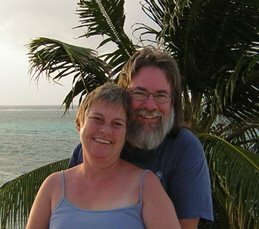 It's unfortunate that you find the blog to have become something less than what we intended - that is a chronicle of our Belizean adventure. By the way, what part of the "gossip" was in error?